Speleology is an activity for everyone, young and old, and supervised by a qualified instructor. LIVE AN EXCEPTIONAL AND UNFORGETTABLE ADVENTURE. You have taken the time to visit the castle of Beynac, to contemplate the gardens of Marqueyssac or to visit the city of Sarlat? Come and try a new underground experience: caving. 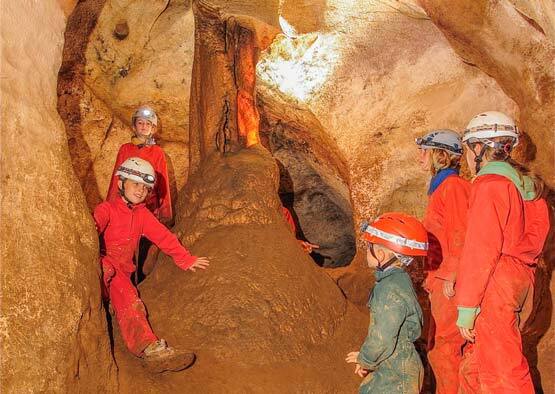 In Dordogne, many visitors want to explore underground cavities. Speleology has become in a few years, an essential activity in the Lot. Speleology in Dordogne is known for the cave of Maxange, the grotto of Grand Roc or the cave Tourtoirac. You will have the opportunity to meet unusual landscapes: narrow tunnels, underground rivers, chasms and other breathtaking environments. Speleology is an activity for everyone, big or small, and supervised by a qualified instructor. The Dordogne Valley and the Causses du Quercy Regional Nature Park are full of caves and chasms offering a whole world of natural cavities to explore. Our instructors are happy to share their passion with you and help you discover the silent, secret and magical world of the underground world. Emotions and sensations guaranteed. You will have the opportunity to do an introduction to caving or to take the opportunity to confirm your experience. Combinations provided. Provide good shoes and swimsuit following cavity.